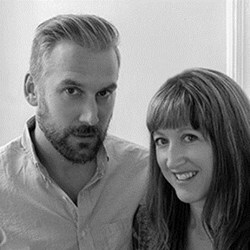 Gina Triplett and Matt Curtius met while attending the Maryland Institute College of Art where she studied illustration, and he studied painting. Their work today draws upon these backgrounds as they bring a personal and expressive perspective to their work for clients. After college they spent some time in New York before settling in Philadelphia, where they now live and work. Their illustrations have been recognized by American Illustration, The Society of Illustrators, and Communication Arts. Gina has been featured on the cover of Step Inside Design, and was selected as one of Print Magazine’s 20 under 30 New Visual Artists. They have exhibited their personal work in New York, LA, and internationally.